Engage your student with Hands on Practice, reproducible worksheets, and assessment tools. 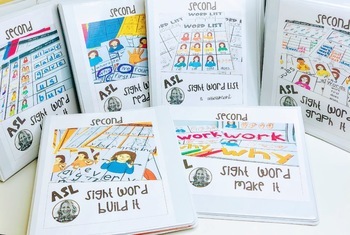 Give your students the multiple exposures and practice they need to master primer sight words. 50 words from the Dolch Second Grade Sight Word List. 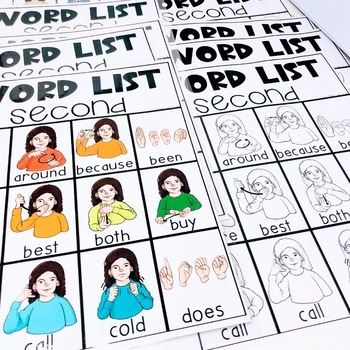 •Student version of Practice word strips. •Teacher version of word strips for tracking and assessment. Students will search the box to find the selected words and write them in the graph. Students will then count how many of each word are on the graph. Graph it also includes word cards to be used to make a graph. These color play dough mats are a perfect kinesthetic center. Students will read the sign, finger-spell the word and roll the play-dough to create the word. In working with k-2 grade students, they LOVE and BEG for the play dough center, so I was super excited to make these. The black and white pages are created to be half page and easily make a book. Students can color a cover page and then add pages as they learn words. Each page shows the Sign, Finger-spelling, and the English word in black and white. Students are able to color the pages and then use them for for repeated sight word practice. 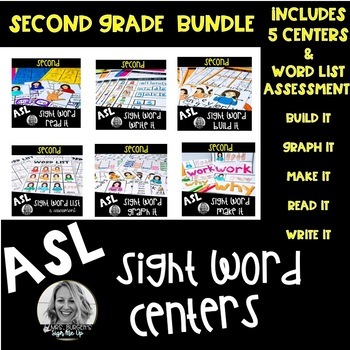 Each worksheet contains the 6 signs with blank spaces and a word bank at the bottom of the page. Students can cross off and write the word or cut and paste the word under the correct sign. Print and laminate the color pages and cut into task cards. Each card contains one sign and 4 words. Students will circle or clip to indicate the correct word to match the sign. I like to print these on colored paper because it gives a nice contrast but that is not necessary. Print the scrambled word pages on white paper. Students will cut and paste the word so the picture and word are in the correct order. Print a copy in black and white and leave intact, apply velcro to each puzzle piece. Students will be able match puzzle pieces to the model. Print the black and white pages to use at a center or send home for extra practice. 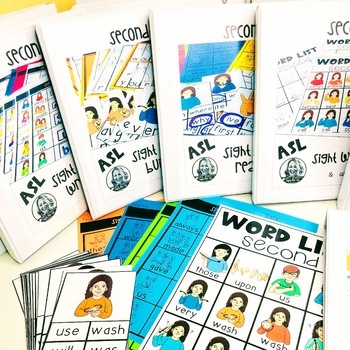 Print and laminate the color pages for repeated practice during class time. Students can easily use a dry-erase marker to write the words and then erase for use by another student. You have the option to leave the pages intact or cut them into strips, as some students are overwhelmed by too much on one page. HAVE QUESTIONS, TROUBLE PRINTING OR FOUND AN ERROR? Please use the Q and A tab below to contact me.